As every pilot and pilot-in-training knows, there's a lot to be aware of and prepare for both before and during flight. 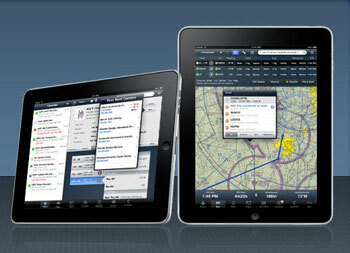 Flight maps, flight plans, weather patterns, TFRs...it's all up to you! And while you have to learn/know the old-fashioned way of finding these things out for your pilot practical exam, technology has made it a lot easier for day-to-day flights. While there are a lot of great apps and software available, at About Time Aviation, we really like ForeFlight Mobile – a flight planning and in-flight support app for pilots available on iPads and iPhones. Easy, convenient, and less cumbersome than pull-out maps and plate books, ForeFlight provides an incredible amount of information at your fingertips. Best of all, we're here to help you check it out! If you would like to take a tour of ForeFlight (a test-run before you buy), or even lessons on how to use the various features, at About Time Aviation we're happy to accommodate you! Instructor Jess Everson is very familiar with the critically acclaimed app (he uses it himself) and can show you its benefits, limitations, and provide tips and tricks. Airports & FBO Directory – Access to airport and FBO data from over 220 countries. Information provided by the FAA, AOPA, Universal Weather and Aviation and ForeFlight's proprietary research. Includes frequencies, runway details, diagrams, phone numbers, fuel prices, operating hours, sunrise/set times, METARs, TAFs, Winds aloft and more. Maps and Charts – Thirteen different weather maps available, ranging from composite reflectivity radar to ceilings and PIREPs. Overlay weather and routes on any of the charts, including VFR/IFR charts and global, data-driven maps. The Terrain Map is a new base map that lets you see terrain features. Low resolution and high resolution terrain databases are available for download. Hazard Advisor – The Hazard Advisor is a terrain and obstacle awareness system for iPad that highlights hazardous terrain and obstacles within 1,000_ of your aircraft's GPS altitude. Instrument Procedures – Approaches, departures, arrivals and diagrams for the entire US and Canadian IFR systems included. Brief & File In Seconds – Build out a trip, send your flight plan to the Brief & File system, get an approved weather briefing, and file your flight plan in seconds. Email confirmations and briefings provided proof of compliance with the regs. Bullet Proof Downloads – ForeFlight's Download Manager keeps your plates, charts, and data up to date as needed, delivered from more than 20 servers worldwide.